LA electro-pop group PHASES (formerly JJAMZ) kicks off a national tour with LIGHTS and The Mowgli’s this Wednesday, November 4th in Austin, TX in support of their acclaimed debut album, For Life. 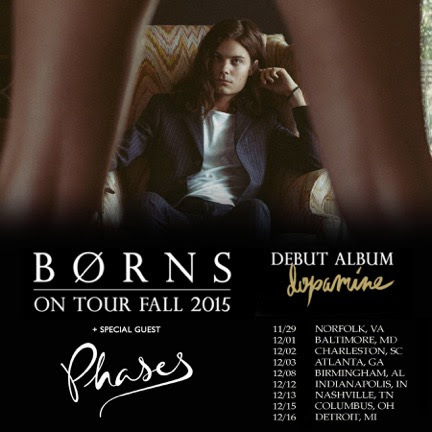 The band has also added dates with Michigan singer-songwriter BØRNS, before they finish out the year with with Maroon 5. Longtime friends Z Berg (The Like), Jason Boesel (Rilo Kiley/Bright Eyes), Alex Greenwald (Phantom Planet) and Michael Runion‘s single “I’m In Love With My Life” is NYLON‘s ‘new morning mantra,’ Buzzfeed‘s ‘Pop Song You Can’t Miss,’ and Flavorwire‘s ‘Top 5 Things We Heard This Week.’ Their music has found fans in Amy Schumer, Sia, Mark Ronson, and Adam Levine, among others, and Jessica Alba sings along in a video for The Honest Company. The band took For Life out on the road earlier this fall, and made a recent appearance at Madison Square Garden Theater in New York with Duran Duran and Adam Lambert. The album has earned praise from USA Today, Vanity Fair, Billboard, InStyle, Entertainment Weekly, PopSugar, and more, and features additional standout tracks, “Betty Blue,” “Cooler,” and “Spark.” Check out the band’s feature on Yahoo! Rising HERE and catch them on the road at the dates below!